The radiology workforce crisis in the U.K. is the most serious issue facing the Royal College of Radiologists (RCR) and its members and fellows. This workforce shortfall is well-recognized and documented due to the comprehensive census the RCR has conducted yearly for the last seven years, successfully gathering robust data from 100% of the hospitals in the U.K. On average, approximately 9% of British radiologist posts are unfilled, with 41% of those having been vacant for over a year. The U.K. has only seven radiologists per 100,000 population, while the European average is 12 radiologists per 100,000 people, putting the U.K. tied third bottom (with Turkey) of 31 European countries. Furthermore, 19% (nearly a fifth) of the current radiology consultant workforce will retire in the next five years, and the mean age of radiologist retirement is 61 years old, and falling. Shortages in radiographers, who acquire the imaging exams, are even worse nationally across the U.K. with an average vacancy rate of 13%, as documented by a recent survey conducted by the Society and College of Radiographers (SCoR). 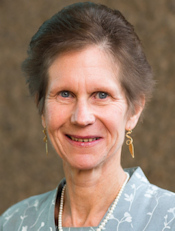 RCR President Dr. Nicola Strickland. Over 88 million pounds (102 million euros) was spent (2015-2016) on outsourcing radiology services to private teleradiology firms and to pay in-house local radiologists to report extra studies in their free time. Outsourcing at night has sustained British radiology by allowing radiologists in district general hospitals (where there are no junior radiologists to be "first on call") to get some sleep at night and be able to work again the next day. However, despite this, waiting times for an imaging report are increasing, and there remain nearly a quarter of a million unreported imaging studies across the U.K. waiting longer than 30 days for a report. The irony of the workforce shortage in the U.K. is that radiology is an extremely popular medical specialty, with every training post being oversubscribed by five to six applicants, of whom four to five are of appointable standard. Unfortunately insufficient numbers of extra radiology training posts are funded by the government every year (by a factor of approximately eight-fold) to make good the deficit. This is part of the more general issue of underfunding of the National Health Service (NHS): The U.K. spends only about 9.1% of its GDP (gross domestic product) on healthcare, compared with 11.1% in Austria, 11.3% in Germany, and 11.5% in France. There is very little private healthcare in the U.K., compared with other European countries with a similar economy. The policy of the RCR to address this crisis comprises long-term and short-term measures. Both need to be acted upon together and without delay, as neither will solve the problem alone. In the mid- to long-term, a very significant increase in radiology trainee numbers is required to fill the shortfall and to take into account the rate of radiology consultant retirements. This requires approximately 260 additional radiology trainees every year for the next five years to meet current demands, and those demands that will also arise from the British Cancer Strategy, patient expectation, new developments including the rapidly growing field of interventional oncology, the national trauma centers, and the likely increased radiology involvement in the treatment of acute stroke (mechanical thrombectomy). The requisite training capacity exists in the U.K., with numerous district general hospitals able to train junior radiologists, and keen to give them a positive experience of their hospitals' radiology department, which will ensure that more trainees are tempted to stay in the local area long term and apply for substantive local consultant jobs, thereafter acquiring their fellowship of the RCR. Increasing the number of district general hospitals taking radiology trainees, and increasing the number of trainees overall, requires government input and support. In the short term, there needs to be a sustained and vigorous program by the British government to recruit more international medical graduates to fill vacant U.K. consultant radiologist posts. Engagement with this process has been limited and slow and there are issues around General Medical Council (GMC) requirements, visas, and NHS human resources engagement. It is essential that any overseas doctors quickly become acclimatized to the professional radiological working environment in the NHS and to the local culture. To that end, the RCR has produced videos and resources, freely available on its website, to assist both those coming to the U.K., and the radiology departments that will be welcoming them. The RCR has also launched a "Jobs Corner" on its website by linking to a radiologist-focused recruitment website, Radjobs. This offers radiologists interested in working in the U.K. a targeted and effective means of finding and assessing vacant radiology posts. Radiology in the U.K. is already provided by an international workforce: over 30% of the consultant radiologist workforce is provided by international medical graduates from 65 different countries, and 31% of those gained their primary degree from a European country medical school. Despite the workforce deficits described above, U.K. radiology offers overseas radiologists many learning opportunities and valued experience of a different way of working. One of the most striking things many overseas radiologists notice about working in the U.K. is that radiologists are first and foremost clinical doctors who provide an essential role "on the ground" in their local hospitals. They are not "remote battery hens" providing a distant reporting service; they are closely involved with running the day-to-day healthcare service for patients. British radiologists are frequently consulted on a face-to- face basis by their ward-based clinical colleagues informally to discuss challenging cases. A large and valuable part of the modern British radiologists' work is preparing for, and presenting the imaging at, multidisciplinary team meetings, which occur on a weekly basis in all medical and surgical specialties. This prioritizes imaging in the healthcare pathway and keeps radiologists abreast of the latest clinical developments in their areas of specialist interest. The rapidly growing specialty of interventional oncology is another area where radiologists in Britain are now more and more involved with the clinical treatment and management of patients as part of the cancer pathway team. Cancer patients are living longer and are increasingly having their chemotherapy and radiotherapy regimens tailored to their particular tumor types. Again, radiologists are responsible for acquiring repeated biopsies on these patients, and for reporting on their follow-up cross-sectional imaging and PET/CT scans, which will guide their tailored further treatment. The yearly appraisals, which it is essential for all British doctors to undergo, mean that radiologists have to be involved with regular audit projects, and take part in frequent peer feedback learning from discrepancies. 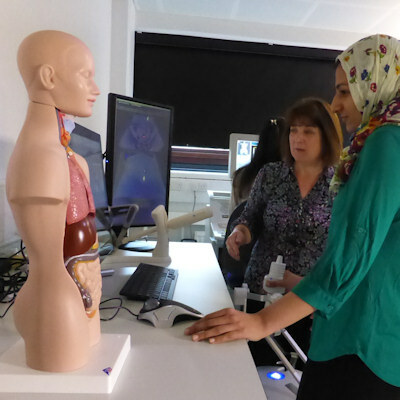 Continued professional development (CPD) is monitored and taken very seriously, enabling British radiologists opportunities to prove they are keeping up to date in their field, and encouraging them to attend professional meetings and engage in online learning and reading. Another area that impresses international medical graduates is the way in which British radiologists work very closely as teams with their nonmedical colleagues, particularly radiographers, sonographers, nurses, and healthcare assistants, with all members of the team treating one another with friendly respect as coworkers. This is particularly true in ultrasound and interventional radiology and oncology settings, but also includes team-working when vetting imaging requests, deciding upon the best protocols to use for a complex scan, and when performing some of the more challenging imaging studies such as cardiac CT and MR, CT colonography, PET/CT, and other nuclear medicine studies. In most of the U.K. nuclear medicine, cardiac and neurological imaging remains under the auspices of radiology, making the discipline a very diverse, yet cohesive, specialty. The fact that almost the whole of British radiology occurs within the public area of the National Health Service, with very little private practice, means that all members of the imaging team are keen to avoid performing any unnecessary imaging studies so the patient follows the most appropriate and streamlined pathway of imaging investigations. The RCR has developed a very well researched iRefer e-guide to advise requesters upon the most appropriate imaging test to investigate the full gamut of clinical patient presentations, and this has now been commercially developed into a full clinical decision support software package that is just starting clinical pilot testing in the U.K. It is fortunate for those coming to the U.K. that English is the most prevalent international language, so working as a radiologist in the U.K. has the added benefit of helping international medical graduates to perfect their linguistic skills and gain confidence using professional English: presenting cases at "Grand Rounds/ Staff Rounds," teaching medical students, trainee radiologists and other junior doctors, and writing reports on imaging studies. The RCR actively encourages research in all aspects of imaging, and because a quarter of its 10,000 membership are clinical oncologists (and the rest radiologists), this facilitates close collaboration, particularly in research into cancer-related topics and interventional oncology image-guided treatments. There are academic committees within the RCR in both clinical radiology and clinical oncology promoting all avenues of research and the college offers numerous bursaries and scholarships, both within the U.K. and abroad, dedicated to the pursuit of research at all levels of radiologists' careers, from consultant level, to trainees, and even including prizes and funds to support medical student projects. Dr. Nicola Strickland is president of the Royal College of Radiologists and a consultant clinical radiologist at Imperial College in London. Originally published in ECR Today on 5 March 2017. A new, free online jobs website has launched in response to the ongoing radiologist shortage in the U.K. There is a serious shortage of Scottish radiologists, and patients are at risk, according to the Royal College of Radiologists.